The history of the Massachusetts Bay Transportation Authority (MBTA) and its predecessors spans two centuries, starting with one of the oldest railroads in the United States. Development of mass transportation both followed existing economic and population patterns, and helped shape those patterns. Mass transit in Boston, Massachusetts began as a family-owned and operated ferry in around 1630. Ground transportation started in Boston with a private stagecoach operation in 1793. The first rail line, which was horse-powered, began on March 26, 1856. Soon there were more than twenty privately run rail lines. In order to regulate fares and reduce competition, the General Court of Massachusetts passed the West End Consolidation Act to consolidate the rail line operations. Steam railroads in Boston in 1880. From the United States Census Bureau. The Haverhill Line was originally chartered as the Andover and Wilmington Railroad in 1833 and extended to Haverhill in 1837 as the Andover and Haverhill Railroad. The line became the Boston & Maine's first acquisition, as the result of a consolidation of three railroads between Boston and Portland, Maine. The Newburyport/Rockport Line was originally chartered as the Eastern Railroad in 1836. The line first opened between Salem and East Boston in 1838. The railroad expanded until it was running from Portland, Maine to Boston, putting the line in direct competition with the Boston & Maine. In 1884, the Eastern Railroad was leased by the Boston & Maine, ending the competition and leading to an outright purchase in 1900. The Penn Central Transportation Company came into existence in 1968 when the New York Central Railroad merged with the Pennsylvania Railroad, absorbing the New York, New Haven and Hartford Railroad at the beginning of 1969. Acquired by the large Old Colony Railroad, much of which was since abandoned, and which later merged into the New York, New Haven and Hartford Railroad and then the Penn Central Transportation Company. The Grand Junction Railroad, built between 1847 and 1856. was owned by a succession of railroad companies, culminating in ownership by CSX Transportation. In 2010, this trackage, along with several other portions of CSX-owned track with current or potential future MBTA service, was purchased by the state for the MBTA. For years, the MBTA had used it only for non-revenue movement of trains between the northern and southern halves of its commuter rail system, but it now has plans to use the tracks to route some trains from west of Boston into North Station, to supplement existing routes into South Station. As of 2012, there is some community opposition from the city of Cambridge, Massachusetts, and it is not clear if or when such service will begin. The Grand Junction trackage has also been considered for the proposed Urban Ring Project, intended to bypass severe overcrowding in the Downtown Boston rapid transit stations. Planned West End Street Railway system, 1885; consolidation of these lines was complete by 1887. See also Boston horse railroads map.jpg 1880 horse railway map. The Cambridge Railroad was the first streetcar company in Massachusetts. It was chartered in 1853 to connect the West End of Boston to Central Square and Harvard Square in Cambridge via the West End Bridge (which was at the site of the modern Longfellow Bridge, itself completed in early August 1906), using horse-drawn streetcars. This is the same route followed by today's Red Line subway, but on the surface street network. Another streetcar company, the Dorchester Railroad, was chartered in 1854. A profusion of streetcar lines were laid down throughout the Boston area by these and other competing companies. In 1885, the West End Street Railway was chartered. The company consolidated ownership of existing streetcar lines in Boston and the inner suburbs, and began converting the animal-drawn vehicles to electric propulsion. The first electric trolleys ran in 1889, and the last horsecar went out of service around 1900. In the late 19th century and early 20th century, two other streetcar companies gained consolidated ownership of many smaller lines. 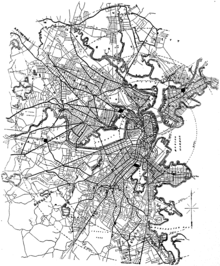 The Middlesex and Boston Street Railway came to control the western suburbs, and the Eastern Massachusetts Street Railway came to control the northern and southern suburbs. Severe streetcar congestion on streets in downtown Boston created the need for subways and elevated rail. These grade-separated railways would add transportation capacity, and avoid delays caused by intersections with cross streets and growing congestion in mixed street traffic. The West End Street Railway was renamed the Boston Elevated Railway (BERy), and undertook several such projects. Boston's subway was the first in the United States and is often called "America's First Subway" by the MBTA and others. In 1897 and 1898, the Tremont Street Subway opened as the core of the precursor to the Green Line. In 1901, the Main Line Elevated, the precursor to the Orange Line opened. It was a rapid transit line running as an elevated railway through outlying areas and using the Tremont Street Subway downtown, with the outer tracks and platforms reconfigured for Elevated trains. The Atlantic Avenue Elevated opened soon after, providing a second route through downtown. This was the first elevated railway and the first rapid transit line in Boston, three years before the first underground line of the New York City Subway, but some 33 years after the first elevated railway in New York. In 1904, the next line to open was the East Boston Tunnel, a streetcar tunnel under Boston Harbor to East Boston. This replaced a transfer between streetcars and ferries, and provided access to the other subways downtown. The tunnel was converted to rapid transit specifications in 1924, with an easy cross-platform streetcar transfer at the East Boston end. In 1908, the Washington Street Tunnel opened, giving the Elevated a shorter route through downtown and returning the older Tremont Street Subway to full streetcar service. Various extensions and branches were built to the Tremont Street Subway in both directions, bypassing more surface tracks. In addition, when the Main Line El opened in 1901, many surface routes were cut back to its Dudley and Sullivan Square terminals to provide a transfer for a faster route downtown. Further elevated extensions, as with the Charlestown Elevated, were soon built on each end, and more streetcar lines were connected. In 1912, the Cambridge Tunnel opened, connecting the Downtown Boston routes to Harvard Square in Cambridge. 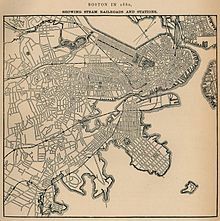 It was soon extended south from Downtown to Dorchester as the Dorchester Tunnel. The Dorchester Extension, opening in stages from 1927, took the line further along a former New York, New Haven and Hartford Railroad branch through Dorchester, with the Ashmont-Mattapan High Speed Line continuing along the old right-of-way to Mattapan. This, too, resulted in cutbacks in streetcar service to its terminals. As built, many of the key rapid transit transfer stations were prepayment stations, in which free transfers could be made between surface streetcar lines and grade-separated subway or elevated lines. This was made possible by the operation of all services under one umbrella; some suburban services that operated over the same streetcar tracks used different areas outside fare control. Some of the streetcar levels in transfer stations were later converted for bus or trackless trolley operation; other such spaces have been closed. Some of the prepaid transfer areas still exist architecturally, and faregates enclose all subway stations (but not most above-ground Green Line stops). Free in-station transfers were eliminated in October 1961, except among subway routes at the transfer stations in Downtown Boston. Transfers between bus and rapid transit were restored, in a limited capacity in 2000, and in full in 2007 as long as a CharlieCard is used. Transfers between bus and subway are reduced price but not free, while a single transfer between one local bus and another is free. Prepayment stations included Andrew (still in place), Arborway, Ashmont, Broadway, Dudley, Egleston, Everett, Fields Corner, Forest Hills, Harvard (still in place), Hynes Convention Center, Kenmore (still in place), Lechmere (still in place), Maverick, Ruggles (built for buses, still in place), Savin Hill, Sullivan Square, Watertown (only served surface and surface-subway streetcars) and Wood Island (built for buses). The Boston Elevated Railway started replacing rail vehicles with buses in 1922, a process later dubbed "bustitution". The last Middlesex and Boston Street Railway streetcars ran in 1930. The BERy started replacing some rail vehicles with trackless trolleys in 1936. By the beginning of 1953, the only remaining streetcar lines fed two tunnels — the main Tremont Street Subway network downtown and the short tunnel (now the Harvard Bus Tunnel) in Harvard Square. Diesel-powered buses could not be used in the tunnels due to the problem of venting exhaust fumes. In 1958, the Harvard Square tunnel routes were replaced with electrically powered trackless trolleys, which were the only such MBTA routes. A short non-revenue connection from the terminus of the #71 trackless trolley out of Harvard Square runs to the Watertown Carhouse for maintenance. In the 21st century, with the new Phase 2 Silver Line in South Boston, trackless trolley services were extended for the first time in decades. The old elevated railways proved to be an eyesore, and several sharp curves following Boston's twisty streets became more problematic because of severe speed limitations, high maintenance, and noise. The beginning of the decline of the Atlantic Avenue Elevated line was the Boston molasses disaster of 1919, which interrupted service on the line. After another serious accident in 1928, the Atlantic Avenue Elevated was partially closed, running as a stub shuttle. In 1938, it was completely shut down, and then demolished for scrap metal in 1942. In 1944, passenger service on the Fairmount Line was canceled by the New York, New Haven and Hartford Railroad after a long period of declining ridership. As rail passenger service became increasingly unprofitable, largely due to the increasingly popular automobile, government takeover became necessary to prevent abandonment of commuter rail services by bankrupt railroad companies. In 1947, the newly formed Metropolitan Transit Authority (MTA) purchased and took over subway, elevated, streetcar, and bus operations from the Boston Elevated Railway. The original MTA district consisted of 14 cities and towns — Arlington, Belmont, Boston, Brookline, Cambridge, Chelsea, Everett, Malden, Medford, Milton, Newton, Revere, Somerville, and Watertown. The last two streetcar lines running into the Pleasant Street Portal of the Tremont Street Subway were replaced with buses in 1953 and 1962, and the portal has since been covered over by a public park. Between 1952 and 1954, the Revere Extension (now part of the Blue Line) opened to Wonderland, mostly along the former narrow-gauge Boston, Revere Beach and Lynn Railroad right-of-way. In 1959, MTA streetcar service opened on what is now the Riverside Green Line "D" Branch, connecting to the Boylston Street Subway and using trackage purchased from the New York Central Railroad, which had stopped running on the line the previous year. The new service required much more rolling stock than expected, due to heavy ridership. Also in 1959, with the opening of the Southeast Expressway, the New York, New Haven and Hartford Railroad halted passenger service on the former Old Colony Railroad lines. Replacement rapid transit service was promised. but did not open until a dozen years later, with the service finally going just beyond the new Expressway's southern end nine years afterwards. On August 3, 1964, the MBTA succeeded the MTA, with an enlarged service area of 78 cities and towns. A 79th community (Maynard) joined in or before 1972 and left in or after 1976. The MBTA was formed partly to subsidize existing commuter rail operations, provided at that time by three private railroad companies — the Boston and Maine Railroad, the New York Central Railroad (via the Boston and Albany Railroad), and the New York, New Haven and Hartford Railroad — with the B&M running the north-side lines and the NYC and NYNH&H (both merged into Penn Central in 1968, and taken over by Conrail in 1976) on the south side. The MBTA soon began to subsidize the companies, and acquired the lines in stages from 1973 through 1976, but with major cutbacks in service and coverage area. Since then, many of these lines have seen service return, most notably the Old Colony Railroad (NYNH&H) lines to the South Shore. By 1964, commuter rail service to Worcester was being provided. In 1965, the Boston and Maine Railroad started receiving MBTA subsidies for its commuter service. In 1973, the MBTA bought most of its present-day commuter rail trackage from the Boston and Maine Railroad and Penn Central (into which the New York Central Railroad and the New York, New Haven and Hartford Railroad had merged). It also purchased rolling stock at this time. Trackage between Framingham and Worcester was not acquired by the agency, and due to a lack of state subsidy, commuter rail service on this portion was cut in 1975. Service was resumed in 1994, though the track was still privately owned until the state purchased it from CSX Transportation in 2011. The Fairmount Line was purchased from Penn Central in 1976. Passenger service resumed there in 1979 during diversion of other lines during Southwest Corridor construction, and was continued even after the project was complete. In 1965, the MBTA assigned colors to its four rapid transit lines, and lettered the branches of the Green Line from north to south. However, shortages of streetcars, among other factors, eventually caused bus substitution of rail service on two branches of the Green Line. In 1969, the "A" Branch was replaced by bus service in its entirety. In 1985, the portion of the "E" Branch from Heath Street to Arborway was replaced by buses. In 1968, the MBTA purchased bus routes in the outer suburbs to the north and south, from the Eastern Massachusetts Street Railway. Western suburban routes were purchased in 1972 from the Middlesex and Boston Street Railway. (Both of these companies had long since ceased running any streetcar service). A few routes to the north were taken over from Service Bus Lines in 1975, and one in the south in 1980 from the Brush Hill Transportation Company. As with the commuter rail system, many of the outlying routes were dropped soon before or after the takeover, due to low ridership and high operating costs, and out-of-district communities refusal to join or contract with the MBTA. In the 1970s, the MBTA received a boost from the BTPR areawide re-evaluation of the role of transit relative to highways. Following a moratorium on major highway construction inside Route 128, numerous transit lines were planned for expansion by the Voorhees-Skidmore, Owings and Merrill-ESL consulting team. The Charlestown Elevated, part of the Orange Line north of downtown Boston, was replaced by the Haymarket North Extension in 1975. The Braintree Extension, a branch of the Red Line to Braintree, opened in stages from 1971 to 1980, upgrading an existing rail corridor. The Red Line Northwest Extension to Alewife opened in 1985, with an intermediate opening in 1984, partly along a railroad corridor and partly through a newly built deep-bore tunnel. The southern part of the Washington Street Elevated lasted until 1987, when the Southwest Corridor was opened, rerouting service from discontinued elevated trackage to new facilities in a parallel existing rail corridor. The closure of the Washington Street Elevated south of downtown Boston brought the end of rapid transit service to the Roxbury neighborhood, which was eventually replaced with the Silver Line Bus Rapid Transit. These extensions provided not only additional subway system coverage, but also major parking structures at several of the terminal and intermediate stations. For example, the Route 2 freeway ends at the Red Line terminus, Alewife station, where there is a large parking garage operated by the MBTA. With the 2004 replacement of the Causeway Street Elevated by a subway tunnel connection, the only remaining elevated railways are a short portion of the Red Line at Charles/MGH, and a short portion of the Green Line between Science Park and Lechmere. In 1999, the district was expanded further to 175 cities and towns, adding most communities that were served by or adjacent to Commuter Rail lines (again including Maynard). The MBTA did not assume responsibility for local transit service in those communities, some of which run their own buses, and some of which depend on private bus services. Prior to July 1, 2000, the MBTA had been automatically reimbursed by the Commonwealth of Massachusetts for all costs above revenue collected (net cost of service). Beginning on that date, the T was granted a dedicated revenue stream consisting of amounts assessed on served cities and towns, along with a dedicated 20% portion of the 5% state sales tax. Going forward, the MBTA now would have to live within this "forward funding" budget. The Commonwealth assigned to the MBTA responsibility for increasing public transit to compensate for increased automobile pollution from the Big Dig. The T submerged a nearby portion of the Green Line and rebuilt Haymarket and North Stations during Big Dig construction. However, these projects have strained the MBTA's limited resources, since the Big Dig project did not include funding for these improvements. Since 1988, the MBTA has been the fastest expanding transit system in the country, even as Greater Boston has been one of the slowest growing metropolitan areas in the United States. When, in 2000, the MBTA's budget became limited, the agency began to run into debt from scheduled projects and obligatory Big Dig remediation work, which have now given the MBTA the highest debt of any transit authority in the country. In an effort to compensate, rates underwent an appreciable hike on January 1, 2007. Increasingly, local advocacy groups are calling on the state to assume $2.9 billion of the authority's now approximate debt of $9 billion, the interest on which severely limits funds available for required projects. In 2006, the creation of the MetroWest Regional Transit Authority saw Framingham, Natick, Weston, Sudbury, Wayland, Marlborough, Ashland, Sherborn, Hopkinton, Holliston, and Southborough subtract their MWRTA assessment from their MBTA assessment. Communities that are also members of other RTAs such as CATA, MVRTA, LRTA, WRTA, GATRA, and BAT may also subtract their RTA assessment from their MBTA assessment. The amount of funding the MBTA received remained the same; the assessment on remaining cities and towns increased but is still allocated by the same formula. On October 31, 2007, the MBTA reestablished commuter rail service to the Greenbush section of Scituate, the third branch of the Old Colony service. Rail renovation on the Green Line "D" Branch took place in the summer of 2007. New, low-floor cars on the line were introduced on December 1, 2008. In 2008, Daniel Grabauskas, then the MBTA General Manager, revealed that the MBTA cut trips from published train and bus schedules without informing passengers, referred to as “hidden service cuts”, saying this misrepresentation of service had been happening for years. Grabauskas said this practice has been ended. On June 26, 2009, Governor Deval Patrick signed a law to place the MBTA along with other state transportation agencies within the administrative authority of the Massachusetts Department of Transportation (MassDOT), with the MBTA now part of the Mass Transit division (MassTrans). The 2009 transportation law continued the MBTA corporate structure and changed the MBTA board membership to the five Governor-appointed members of the Mass DOT Board. Rhode Island, which has funded commuter rail service to Providence since 1988, paid for extensions of the Providence/Stoughton Line to T.F. Green Airport in 2010 and Wickford Junction in 2012. The Fairmount Line, located entirely in the southern reaches of Boston, has been undergoing an improvement project since 2002. The first new station, Talbot Avenue, opened in November 2012. Claims have been made by the Pioneer Institute that since 1988 the MBTA has been the fastest expanding transit system in the country, even as Greater Boston has been the slowest growing metropolitan area. However, research by the Frontier Group finds that "no category has the MBTA been the “fastest-growing” of the nation’s largest transit agencies, and in only two categories does it crack the top 10. However, the MBTA does crack the top 10 in another category: absolute growth in transit ridership." When, in 2000, the MBTA's income was capped, the agency began to run up large debts from already-scheduled projects and obligatory Big Dig remediation work. As of 2012[update], the MBTA has the highest debt of any transit authority in the United States. In an effort to compensate, rates were hiked on January 1, 2007, from $1.25 up to $2.00 per subway ride with a CharlieTicket, and $1.70 with a CharlieCard. Increasingly, local advocacy groups are calling on the state to assume $2.9 billion of the authority's debt, which totals approximately $9 billion. The interest on this debt is a large proportion of the MBTA's annual expenses, and severely limits funds available for any further required projects. In April 2012, the MBTA Advisory Board approved major fare increases on all MBTA services, and cutbacks or terminations of some transit routes. In July 2014, fares were increased further by an average of 5%. On October 10, 2007, the MBTA introduced a pilot program in North, South, and Airport stations called T-Radio. The program would have been expanded to pipe in music, light news, weather, entertainment tips, and eight to ten minutes of commercials each hour to every MBTA subway station. After the agency received an overwhelming number of e-mails — 1,800, mostly complaints — it decided to shelve the program on October 25. On May 28, 2008, a westbound trolley on the Green Line "D" Branch slammed into a stopped train between the Waban and Woodland stations shortly after 6 p.m. At least seven people were injured, and the operator of the moving train, Terrese Edmonds, 24, was killed. On May 8, 2009, two Green Line trolleys collided between Park Street and Government Center when the driver of one of them, 24-year-old Aiden Quinn, was text messaging his girlfriend. A rule banning cell phones for operators while driving their bus, train, or streetcar was put into place days later. Immediately following the 2013 Boston Marathon bombings, the MBTA was partially shut down and National Guardsmen were deployed in various stations around the city. During the ensuing manhunt for Dzhokhar and Tamerlan Tsarnaev the MBTA was fully shut down until the stay-inside request for Watertown, Newton, Waltham, Cambridge, Belmont, and Boston was lifted. During the manhunt, MBTA buses were used to ferry police around the city. After the suspect was caught the MBTA resumed normal service. The next day the MBTA began displaying "BOSTON STRONG" and "WE ARE ONE BOSTON" on buses and subway cars, in addition to the destination that is normally displayed. In February 2015, there was record breaking snowfall in Boston from the 2014–15 North American winter causing severe delays on all MBTA Subway lines, and many long-term operational and financial problems with the entire MBTA system came under greater public attention. Massachusetts Governor Charlie Baker indicated at the time that he was reluctant to discuss the financing issues but that he would "have more to say about that in a couple of weeks." Following criticism of his emergency management and polling demonstrating public opinion in favor of his administration prioritizing resolving the MBTA's issues, Baker announced the formation of a special advisory panel to diagnose the MBTA's problems and write a report recommending proposals to address them. The special advisory panel released its report that April. The report was broadly critical of MBTA operational and financial management, noting that the system was in "severe financial distress", was "governed ineffectively", spent inefficiently, and had a high-absentee workplace culture. Among other reforms, the report recommended suspending the governance of the agency by the MassDOT Board of Directors; replacing it with a temporary Fiscal and Management Control Board directly appointed by the Governor and the leadership of the state legislature; expanding the existing MassDOT Board; and adding term limits. The MassDOT Board resigned on Baker's request the following week. Legislation, which closely followed the report's recommendations, passed the following July along with the appointment of the Fiscal and Management Control Board. Baker also appointed a new MassDOT Board of Directors and proposed a five-year, $83 million winter resiliency plan. After initially blaming the snowfall and a lack of public investment in an aging system for the crisis, MBTA General Manager Beverly Scott announced her resignation effective April 11. MassDOT Chief Operating Officer and Highway Division Administrator Frank DePaola was appointed to fill Scott's position. DePaola retired June 30, 2016, and was replaced with Brian Shortsleeve. Shortsleeve swapped positions with Fiscal and Management Control Board vice chair Steve Poftak on June 30, 2017. Baker launched a search for a permanent MBTA General Manager in February 2017. That August, the MBTA named former General Electric executive Luis Ramirez to be its new General Manager. Ramirez's previous management experience, as well as the process for vetting him, came under public scrutiny and criticism because of a twice-dismissed class action lawsuit during his tenure as CEO of the Dallas-based Global Power Equipment Group. Even so, Baker spoke in favor of Ramirez, who began his tenure as MBTA General Manager on September 12, 2017. Ramirez left the position effective January 1, 2019, and was replaced by Steve Poftak. In June 2015, the MBTA scaled back the schedule for a one-year pilot program to expand late-night service on weekends, having expanded it that February. The program was cut in March 2016. Despite this setback, improvements were made to service during this time. In October 2015, the MBTA announced that the Commuter Rail was adding nonstop trips during peak commute times along the Framingham/Worcester Line between Back Bay and Worcester Union Stations. In March 2016, the MBTA reopened Government Center Station after two years of construction upgrades. In September 2016, a month after Baker signed into law a regulatory framework for transportation network companies, Baker and the MBTA announced a pilot program partnering the MBTA's The Ride with Uber and Lyft to improve paratransit services for disabled riders, which was expanded the following February to all users of The Ride. In December 2016, the MBTA Fiscal and Management Control Board approved a proposal to replace all MBTA Red Line fleet vehicles by 2025. In January 2017, the MBTA announced that the new Boston Landing Station on the Commuter Rail's Framingham/Worcester Line would open the following May. A groundbreaking for the $38.5 million renovation of Ruggles Station, in Roxbury, occurred that August. In April 2017, the Federal Transit Administration approved a revised cost estimate for the Green Line Extension proposed by the MBTA Fiscal and Management Control Board and the MassDOT Board of Directors, allowing the project to be eligible for federal funding. The Green Line Extension broke ground in Somerville the following June. In April 2018, the MBTA began a one-year pilot program for early morning bus service along certain MBTA Bus routes in Boston (which the Fiscal and Management Control Board voted to make permanent the following December), and the MBTA Silver Line began operating a route from Chelsea to South Station. In June 2018, the MBTA began a 3-month pilot of a summer weekend Commuter Rail fare of $10 for unlimited use, which was subsequently extended another three months. Also in June 2018, the MBTA announced parking fee changes based on parking lot usage, and the MBTA released estimates showing that the proposed North–South Rail Link would cost between $12.3 billion and $21.5 billion. In January 2019, following a one-month hiatus, MBTA General Manager Steve Poftak announced that the Federal Transit Administration approved a six-month extension of the Commuter Rail weekend fare pilot beginning that month. In August 2015, MBTA officials released revised estimates of the MBTA's State-of-Good-Repair backlog upwards to $7.3 billion. While MBTA officials announced the following month that advertising revenue was running 26 percent higher that year than at the same time the previous year, the Fiscal and Management Control Board released its first report. The board report showed that the MBTA's operating expenses and debt service were growing nearly three times the rate of revenue growth—being projected to grow from a projected $170 million in fiscal year 2016 to a projected $427 million by fiscal year 2020 if left unaddressed—and that operator absences accounted for 69 percent of the 34,347 dropped bus runs and subway trips between January and August of that year. The Fiscal and Management Control Board voted to increase fares across the system by an average of 9.3 percent that March. However, according to an April 2016 estimate, the agency was losing $42 million per year due to fare evasion. In June 2016, the MBTA Fiscal and Management Control Board voted unanimously to indefinitely extend a pilot program of discounted passes for low-income youths and to increase the maximum age for participation in the program to 25. In July 2016, after the Fiscal and Management Control Board completed its first year, Baker addressed the status of MBTA operations and financial management. There was significant progress, including a leveling of the MBTA operating expense budget between the 2015 and 2016 fiscal years (after a 5 percent per year increase over the previous 15 years), a 25 percent decline in operator absenteeism, a 30 percent decline in overtime expenses, a one-third decline in dropped bus runs, and improvements to system infrastructure. However, at the same time, Baker noted that the MBTA was "still in very tough shape", reiterating concerns about the MBTA pension system, the security of the MBTA's cash-handling operations, need for reform to the MBTA's procurement and contracting system, and improvements to its infrastructure maintenance system highlighted in the advisory panel report. Also in July 2016, Baker signed into law a bill capping MBTA fare increases to 7 percent once every two years. In October 2016, the MBTA Fiscal and Management Control Board voted to outsource the MBTA's cash-handling operations to the security company Brink's on a $18.7 million, five-year contract, a decision opposed by unions and elected officials. The MBTA also extended its existing contract with the Boston Carmen's Union in December 2016 through 2021 with new wage structures that would reduce the MBTA's operating budget by $80 million over the subsequent four years. The following month, the agency outsourced its warehousing and parts-delivery operations to an external vendor for $28.4 million on a five-year contract. In April 2017, the Fiscal and Management Control Board approved a $1.98 billion budget which reduced the MBTA operating budget deficit from $42 million to $30 million. The following month, Baker approved the Fiscal and Management Control Board's request to exercise the two-year extension option to continue its governance of the MBTA allowed under the law that authorized its formation. In July 2017, interim MBTA General Manager Steve Poftak said that the MBTA would accelerate its capital spending from an average of $437 million (excluding expansion projects) in the previous five years to $702 million for fiscal year 2019. Simultaneously, Poftak also noted that the MBTA was "saving money" by outsourcing "ancillary" operations to vendors. In November 2017, the MBTA Fiscal and Management Control Board voted to award a 13-year contract for $723 million to the Cubic Corporation to design, implement, and operate a new fare collection system for the MBTA by 2020. In February 2018, MBTA General Manager Luis Ramirez announced to the Fiscal and Management Control Board that the MBTA would face a $111 million operating budget deficit for fiscal year 2019. However, that August, MBTA officials announced that the agency had finished the 2018 fiscal year with a balanced operating budget for the first time in a decade. Boston Elevated Railway streetcar lines in 1940. Lighter lines were abandoned earlier; the darkest ones still existed in 1969. Streetcar lines remaining in Boston in 1953. MBTA Commuter Rail service in 1975. ^ "The Ferry Five". MBTA. Retrieved December 15, 2016. ^ "The Omnibus". MBTA. Retrieved December 15, 2016. ^ "Horsecars on Rails and the West End Street Railway Company". MBTA. Retrieved December 15, 2016. ^ "Eastern Railroad Company of Massachusetts Records, 1839-1840, 1874-1877". Harvard Business School. HBS Baker Library. Retrieved August 12, 2014. ^ Dyer, John (June 16, 2010). "Much is Riding on Worcester Rail Deal". Boston Globe. Retrieved October 11, 2011. ^ Moskowitz, Eric (August 9, 2010). "Signals crossed on Worcester link". Boston Globe. Retrieved September 4, 2010. ^ "Famous Firsts in Massachusetts". Commonwealth of Massachusetts. Retrieved November 13, 2006. ^ a b Koebel, Romin (2005). "Boston Transit Milestones". MIT Open Courseware. Archived from the original on September 20, 2006. Retrieved August 1, 2012. ^ "T expansion on wrong track". The Boston Globe. May 24, 2006. ^ "Legislators, Advocacy Groups And T Riders Call For MBTA Debt Relief". MASSPIRG. Archived from the original on October 2, 2011. Retrieved January 21, 2015. ^ "High hopes aboard as Greenbush commuter train gets rolling - The Boston Globe". Boston.com. November 1, 2007. Retrieved June 6, 2012. ^ Masis, Julie (July 1, 2007). "On D Line, A for effort, D for delay: Many riders cite longer commute". The Boston Globe. Retrieved February 3, 2018. ^ Herald, Boston (February 16, 2008). "Bus-ted: T lied to cut costs - BostonHerald.com". News.bostonherald.com. Retrieved June 18, 2012. ^ "Governor Patrick Signs Bill to Dramatically Reform Transportation System: New law will put an end to big dig culture, abolish the turnpike and help secure the commonwealth's economic future". Press Release. Office of the Governor of Massachusetts. June 26, 2009. Archived from the original on June 5, 2011. Retrieved January 21, 2015. ^ "Chapter 25 of the Acts of 2009: An Act Modernizing the Transportation Systems of the Commonwealth". Session Laws 2009. General Court of the Commonwealth of Massachusetts. June 29, 2009. Retrieved July 18, 2009. ^ Bierman, Noah (January 15, 2009). "Senate roadway plan avoids tax or toll hike: Critics say concept ignores cash need". Boston Globe. Retrieved July 18, 2009. ^ Viser, Matt; Noah Bierman (June 18, 2009). "Legislature approves transportation bill despite union concerns". Boston Globe. Retrieved July 18, 2009. ^ Brownsberger, Will; State Representative; 24th Middlesex District (June 18, 2009). "Transportation Reform Enacted". WillBrownsberger.com. Archived from the original on October 8, 2011. Retrieved January 21, 2015. ^ Rocheleau, Matt (November 12, 2012). "MBTA opens new commuter rail station at Talbot Avenue in Dorchester on Fairmount Line". Boston Globe. Retrieved November 12, 2012. ^ "Pioneer Institute Says MBTA Is Fastest-Growing Transit Agency. It's Not". The Pioneer Institute. March 3, 2015. ^ Bierman, Noah (October 11, 2007). "T gives music a test run". The Boston Globe. ^ Bierman, Noah (October 25, 2007). "After two-week trial, T Radio is silenced". The Boston Globe. ^ Boston Globe, May 29, 2008, "Fatal Crash On Green Line", pp. A1,A18. ^ "Trolley Driver Was Texting Girlfriend At Time Of Crash: 46 Injured In Green Line Crash" Archived February 22, 2012, at the Wayback Machine, WCVB, Boston, May 8, 2009. ^ "Trolley Crash Inspires Tougher Cell Phone Policy: NTSB Still Investigating Crash". WCVB Boston. May 9, 2009. Archived from the original on February 22, 2012. Retrieved January 21, 2015. ^ Spc. Michael V. Broughey, 65th Public Affairs Operations Center (April 24, 2013). "Soldiers deploy to MBTA subway stations following the Boston Marathon bombing | Article | The United States Army". Army.mil. Retrieved September 18, 2013. ^ Shirley Leung (April 19, 2013). "MBTA shutdown during hunt for Marathon bombing suspect irks commuters". Boston.com. Boston Globe. Retrieved February 12, 2014. ^ Bernstein, David S. (April 22, 2013). "MBTA Buses Display 'Boston Strong' Messages". Bostonmagazine.com. Metrocorp, Inc. Retrieved February 23, 2014. In a show of support for the families affected by the bombing, the T put up compassionate sayings. ^ "Big MBTA Woes For Weather-Weary Commuters". WBUR. February 3, 2015. Retrieved March 12, 2018. ^ Lepiarz, Jack (February 4, 2015). "With Widespread Delays, MBTA's Long-Standing Issues Come Into Focus". WBUR. Retrieved March 12, 2018. ^ "Understanding The MBTA's Financial Problems". WBUR. February 10, 2015. Retrieved March 12, 2018. ^ Khalid, Asma (February 5, 2015). "Baker Reluctant To Discuss Additional Transportation Financing". WBUR. Retrieved March 12, 2018. ^ Waxman, Simon (February 12, 2015). "Amid The T's Crisis, Gov. Baker Is Showing His Management Style. It's Not Pretty". WBUR. Retrieved March 12, 2018. ^ Khalid, Asma (February 18, 2015). "WBUR Poll: Bostonians Believe Fixing MBTA Should Be A 'Major Priority' For Gov. Baker". WBUR. Retrieved March 12, 2018. ^ Conway, Abby Elizabeth (February 20, 2015). "Gov. Baker Creates Advisory Panel To 'Diagnose' MBTA Woes". WBUR. Retrieved March 12, 2018. ^ Back on Track: An Action Plan to Transform the MBTA (PDF). www.mass.gov (Report). April 8, 2015. Retrieved March 13, 2018. ^ Murphy, Matt (April 6, 2015). "Task Force Sees 'Excessive Absenteeism' At MBTA". WBUR. Retrieved March 14, 2018. ^ "MBTA Panel Calls for Fiscal Control Board, Multi-Year Plans To Fix Broken System". www.mass.gov. April 8, 2015. Retrieved March 14, 2018. ^ Salsberg, Bob (April 21, 2015). "Embattled State Transportation Board Members Agree To Resign". WBUR. Retrieved December 17, 2018. ^ "Report: Union Vows Fight In MBTA Overhaul Efforts". WBUR. May 28, 2015. Retrieved December 17, 2018. ^ Dumcius, Gintautas (July 8, 2015). "Gov. Charlie Baker granted tools he says he needs to fix the troubled MBTA". MassLive.com. Advance Publications. Retrieved March 14, 2018. ^ Dumcius, Gintautas (July 17, 2015). "Gov. Charlie Baker appoints MBTA fix-it panel". MassLive.com. Advance Publications. Retrieved March 14, 2018. ^ "Governor Baker Signs Fiscal Year 2016 Budget; Enacts MBTA Reforms". www.mass.gov. July 17, 2015. Retrieved March 14, 2018. ^ "Gov. Baker Names Final Member To State Transportation Board". WBUR. May 12, 2015. Retrieved December 17, 2018. ^ Conway, Abby Elizabeth (June 4, 2015). "Baker Proposes $83 Million In MBTA Upgrades To Avoid Another Winter Meltdown". WBUR. Retrieved March 14, 2018. ^ "MBTA To Reopen Wednesday; GM Ties Problems To Record Snowfall, Lack Of Investment". WBUR. February 10, 2015. Retrieved March 12, 2018. ^ Swasey, Benjamin (February 11, 2015). "MBTA GM Beverly Scott Resigns". WBUR. Retrieved December 17, 2018. ^ Lepiarz, Jack (February 25, 2015). "Highway Chief DePaola Named Interim MBTA GM". WBUR. Retrieved December 17, 2018. ^ Gorel, Amy (May 23, 2016). "MBTA General Manager Frank DePaola To Retire". WBUR. Retrieved December 18, 2018. ^ a b Murphy, Matt (May 25, 2017). "Departure Triggers Overhaul Of MBTA Management". WBUR. Retrieved March 27, 2018. ^ Dumcius, Gintautas (February 16, 2017). "Massachusetts Gov. Charlie Baker launching search for 'turnaround CEO' for MBTA". MassLive.com. Advance Publications. Retrieved March 27, 2018. ^ "Former GE Executive Tapped To Lead MBTA". WBUR. August 15, 2017. Retrieved March 27, 2018. ^ Chakrabarti, Meghna; McNerney, Kathleen (August 25, 2017). "State's Contract Raises Questions About Background Check Of New MBTA Chief". WBUR. Retrieved March 27, 2018. ^ Chakrabarti, Meghna; McNerney, Kathleen (August 16, 2017). "Questions About Turnaround Of MBTA GM's Former Texas Firm". WBUR. Retrieved March 27, 2018. ^ Chakrabarti, Meghna; McNerney, Kathleen (August 22, 2017). "The Incoming MBTA GM's Former Company May Face Bankruptcy". WBUR. Retrieved March 27, 2018. ^ Dumcius, Gintautas (August 22, 2017). "Massachusetts Gov. Charlie Baker says he's 'quite confident' in new MBTA general manager despite Global Power lawsuit". MassLive.com. Advance Publications. Retrieved March 27, 2018. ^ Chakrabarti, Meghna; McNerney, Kathleen (September 12, 2017). "New General Manager Takes Over At The MBTA". WBUR. Retrieved March 27, 2018. ^ Swasey, Benjamin (December 11, 2018). "Leadership Change At MBTA: GM Ramirez Is Out After 15 Months". WBUR. Retrieved December 12, 2018. ^ Conway, Abby Elizabeth (June 26, 2015). "Scaled-Back MBTA Late Night Service Begins This Weekend". WBUR. Retrieved December 17, 2018. ^ Conway, Abby Elizabeth (February 5, 2015). "MBTA Extends Late-Night Weekend Service Through June". WBUR. Retrieved December 17, 2018. ^ Conway, Abby Elizabeth; Enwemeka, Zeninjor (February 29, 2016). "MBTA Board Votes To End Late-Night Weekend Service By March 18". WBUR. Retrieved December 18, 2018. ^ Conway, Abby Elizabeth (October 7, 2015). "MBTA Announces Nonstop Commuter Rail Trips Between Worcester And Boston". WBUR. Retrieved December 17, 2018. ^ "MBTA's Government Center Station Reopens After 2 Years Of Construction". WBUR. March 21, 2016. Retrieved December 18, 2018. ^ Dumcius, Gintautas (August 5, 2016). "Gov. Charlie Baker signs law regulating Uber and Lyft in Massachusetts". MassLive.com. Advance Publications. Retrieved April 15, 2018. ^ Jolicoeur, Lynn (September 16, 2016). "MBTA Partners With Uber, Lyft To Improve Services For Riders With Disabilities". WBUR. Retrieved March 27, 2018. ^ Metzger, Andy (February 28, 2017). "App-based rides opened to thousands of MBTA paratransit users". MassLive.com. Advance Publications. Retrieved March 27, 2018. ^ "MBTA To Replace Entire Red Line Fleet By 2025". WBUR. December 12, 2016. Retrieved March 27, 2018. ^ Metzger, Andy (February 27, 2017). "Brighton Commuter Rail Station Set To Open In May". WBUR. Retrieved December 18, 2018. ^ Heyward, Jasmine (August 22, 2017). "Work officially gets underway on Ruggles Station improvement project". Boston.com. Boston Globe Media Partners. Retrieved March 28, 2018. ^ "Scaled-Down Plan For The Green Line Extension Will Move Forward". WBUR. May 9, 2016. Retrieved January 5, 2019. ^ "Feds Approve Revised Cost Estimate For Green Line Extension". WBUR. April 4, 2017. Retrieved December 18, 2018. ^ "Officials Break Ground On Green Line Extension". WBUR. June 25, 2018. Retrieved June 28, 2018. ^ "More Early Morning Bus Services To Be Offered By MBTA". WBZ-TV. April 2, 2018. Retrieved April 15, 2018. ^ Mohl, Bruce (December 17, 2018). "T notes: Board acts as if Ramirez never existed". CommonWealth Magazine. MassINC. Retrieved December 18, 2018. ^ "MBTA Unveils New Silver Line Route From Chelsea To Boston". WBZ-TV. April 21, 2018. Retrieved December 18, 2018. ^ "MBTA Pilots $10 Summer Weekend Commuter Rail Fare". WBUR. May 22, 2018. Retrieved June 15, 2018. ^ Moulton, Cyrus (September 6, 2018). "Commuter rail extends $10 weekend fare until Dec. 9". Telegram & Gazette. GateHouse Media. Retrieved October 10, 2018. ^ Metzger, Andy (June 19, 2018). "MBTA Raising Prices At Some Garages, Dropping Fees At Underused Lots". WBUR. Retrieved October 10, 2018. ^ Metzger, Andy (June 18, 2018). "MBTA Estimate: North-South Rail Link Would Cost At Least $12.3B". WBUR. Retrieved June 28, 2018. ^ Mohl, Bruce (January 2, 2019). "T to relaunch $10 weekend commuter rail fare". CommonWealth Magazine. MassINC. Retrieved April 13, 2019. ^ Salsberg, Bob (August 31, 2015). "MBTA's Repair Backlog Climbs Above $7 Billion". WBUR. Retrieved December 17, 2018. ^ "T Says Advertising Dollars On Rise In 2015". WBUR. September 12, 2015. Retrieved December 17, 2018. ^ Conway, Abby Elizabeth (September 22, 2015). "MBTA Control Board's 1st Report Paints 'A Bleak Picture'". WBUR. Retrieved December 17, 2018. ^ Conway, Abby Elizabeth (September 30, 2015). "MBTA's Workforce Policies 'In A State Of Disrepair,' Control Board Member Says". WBUR. Retrieved December 17, 2018. ^ "MBTA Board OKs Fare Hikes Averaging 9.3 Percent". WBUR. March 7, 2016. Retrieved December 18, 2018. ^ "Officials Estimate MBTA Loses Up To $42M A Year From Fare Evasion". WBUR. April 25, 2016. Retrieved December 18, 2018. ^ Metzger, Andy (June 6, 2016). "MBTA Opening Youth Pass Discount Program To Young Adults". WBUR. Retrieved December 18, 2018. ^ Brown, Steve (July 20, 2016). "MBTA Is Still In 'Very Tough Shape,' Baker Says One Year Into Control Board's Tenure". WBUR. Retrieved March 27, 2018. ^ Brooks, Anthony; Bruzek, Alison (July 5, 2016). "Can The MBTA Pension Fund Be Saved?". WBUR. Retrieved March 27, 2018. ^ Metzger, Andy (July 5, 2016). "Consultant Report Finds Security Lapses At MBTA's 'Money Room'". WBUR. Retrieved March 27, 2018. ^ "Governor Baker Addresses Progress and Future of MBTA Reforms as Fiscal and Management Control Board Completes First Year". www.mass.gov. July 20, 2016. Retrieved March 27, 2018. ^ Murphy, Matt (July 27, 2016). "New Law Means MBTA Fares Can't Go Up More Than 7 Percent Once Every 2 Years". WBUR. Retrieved December 18, 2018. ^ "MBTA Board Votes To Privatize 'Money Room'; Union Officials Arrested In Protest". WBUR. October 6, 2016. Retrieved December 18, 2018. ^ Metzger, Andy (October 6, 2016). "Union Officials And Elected Democrats Rally Against MBTA Privatization". WBUR. Retrieved December 18, 2018. ^ Young, Colin A. (December 19, 2016). "MBTA And Carmen's Union Agree To Contract Running Through 2021". WBUR. Retrieved December 18, 2018. ^ Young, Colin A. (January 9, 2017). "MBTA Board OKs Privatization Of Warehousing And Parts-Delivery Operations". WBUR. Retrieved December 18, 2018. ^ Dumcius, Gintautas (April 13, 2017). "MBTA oversight board approves $1.9 billion budget for transit agency, potential service changes ahead". MassLive.com. Advance Publications. Retrieved March 27, 2018. ^ Dumcius, Gintautas (July 24, 2017). "MBTA, once 'devouring itself,' is on the mend but still needs work, Massachusetts transportation officials say". MassLive.com. Advance Publications. Retrieved March 27, 2018. ^ Brown, Steve (July 24, 2017). "MBTA Officials Say Fiscal And Management Changes Are Producing Benefits". WBUR. Retrieved March 28, 2018. ^ Salsberg, Bob (November 20, 2017). "MBTA Awards $723M Contract For Overhaul Of Fare Collection". WBUR. Retrieved December 18, 2018. ^ Metzger, Andy (February 12, 2018). "MBTA Faces $111 Million Budget Gap". WGBH. Retrieved March 28, 2018. ^ Dumcius, Gintautas (August 13, 2018). "For the first time in 10 years, the MBTA balanced its operating budget". MassLive.com. Advance Publications. Retrieved October 10, 2018. Bierman, Noah (December 26, 2009). "Transit archeology: Tour of abandoned subway network offers a glimpse of how the T was built". The Boston Globe. Cheape, Charles W. (1980). Moving the masses : urban public transport in New York, Boston and Philadelphia, 1880-1912. Cambridge, Mass. : Harvard University Press. ISBN 0-674-58827-4. Cheney, Frank; Sammarco, Anthony Mitchell (2000). When Boston rode the El. Charleston, SC: Arcadia. ISBN 978-0-7385-0462-9. Cudahy, Brian J. (1972). Change at Park Street Under; the story of Boston's subways. Brattleboro, Vermont: S. Greene Press. ISBN 978-0828901734. McKendry, Joe (2006). Beneath the streets of Boston: Building America's first subway. Boston: David R. Godine. ISBN 978-1567922844. Most, Doug (2014). The race underground : Boston, New York, and the incredible rivalry that built America’s first subway. New York: St. Martin’s Press. ISBN 978-0312591328. Wikimedia Commons has media related to Public transport maps of Boston. This page was last edited on 14 April 2019, at 01:50 (UTC).